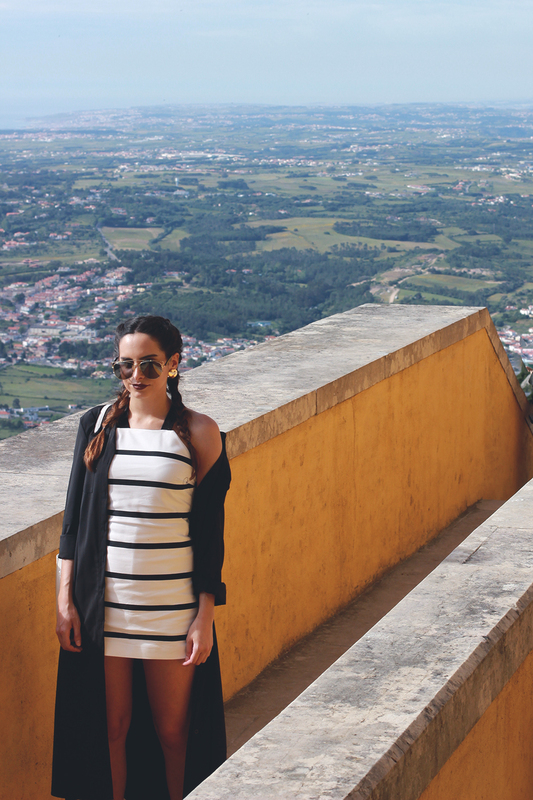 It may seem like we had Palácio da Pena just for us, but it wasn't the case. It was so crowded! And it was simply a random Monday of May. I can only imagine how it's like on the weekend or in August. Better yet, I don't even want to imagine. Somehow we managed to find a spot (this spot) were people wouldn't pass by. Maybe it's because it lead to a dead end. But you know how it is...if people see someone somewhere, everyone wants to go there too. 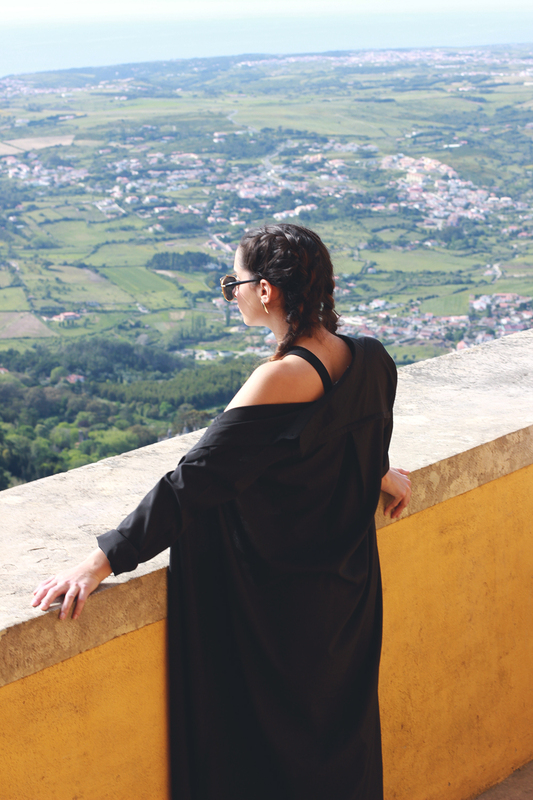 All the sudden, that little spot turned into a must-see, on Palácio da Pena. So many people! this is awesome! Love that hairstyle! Amazing place and amazing look! Love your boxer braids! E ficaram mesmo brutais! Lindas, lindas! E esse outfit?? Menina arrasaste! 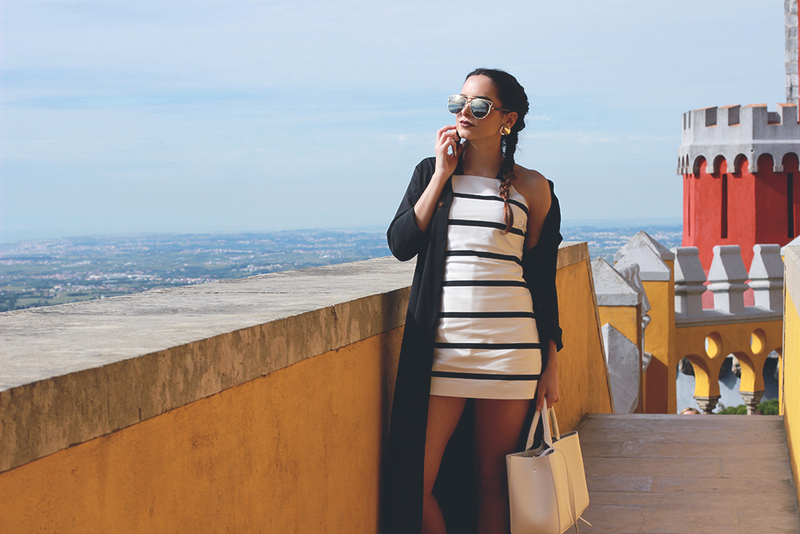 Adorei o contraste das cores do palácio com o outfit B&W! menudo estilazo cariño, unas fotos preciosas! Adorei! As fotos ficaram lindíssimas e o local não podia combinar melhor contigo. You look great on Black and White! Amei conhecer Sintra e este Palácio é encantador!! Muita sorte sua conseguir tirar fotos sem ninguém hahaha Lindas fotos e o look está lindo combinando com as cores intensas pintadas no palácio. Love the first pic!! is an amazing look and you look great with this hair. Uau! Linda!! O penteado fica-te super bem! Gosto imenso do look e de toda a conjugação que fizeste. Ficas linda de tranças, adoro! Amei o look, é um look super prático, mas ao mesmo fancy. Gira gira gira! Não me canso de dizer!